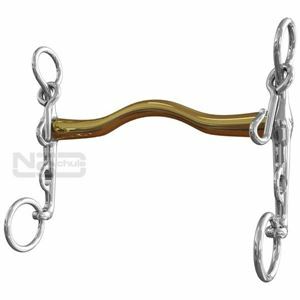 Neue Schule NS Slimma Fixed Cheek Weymouth gives a good lifting action without upper palate interference. The slimmer mouthpiece is a very unobtrusive design that sits well back in the mouth over the thicker, less sensitive part of the tongue. The Slimma Weymouth fixed cheek weymouth is anatomically designed to take up very little room in the mouth bridging the tongue (tongue relief) and contouring snugly under the upper palate leaving much more space for the bridoon, hence a fatter bridoon is an option that may benefit a horse that is tentative into the contact.